A student asked Rinpoche if it was OK to put the Namgyalma mantra on the bottom of his surfboard. Rinpoche replied as follows. No, this would not be appropriate, because you are standing on it, even though the board is between you and the mantra. It would be like putting it on the bottom of your shoes. Even though there is a board between your feet and the mantra (even if it’s at the other end), it’s not appropriate. It would be better to drag it behind the surfboard. Or you could carve the mantra on a big board the size of a table, tie a rope around it, and drag it behind a boat through the ocean. This would be very good and also could be fun and enjoyable. The board should have wings on its edges so it floats on top of the water, with the mantra touching the water and blessing it in this way. After seeing a toy train travelling around on tracks on the ceiling of a restaurant in Washington State, Rinpoche wrote the following about putting Dharma messages on small trains. It would be amazing if there could be buddhas on the top of the small toy train, like Tara statues or tsa-tsas. Also, you could put Dharma messages on the side of the train, similar to the stickers on my car, so that anyone who comes into the restaurant sees the messages. If people are depressed and their life is full of problems, and they see the messages, maybe it will help them. That is the best meditation and best philosophy. If people think this way, then it stops problems and their life is saved. They are saved from killing themselves if they are suicidal, or saved from problems in their life, relationship problems. They will have more happiness in their life—at work, with others and with their family. It is such a great opportunity and so easy to do. You could also put Universal Education messages on the train. Rinpoche composed the following sign to be attached to a well that had been built for some villagers. Rinpoche also requested a Medicine Buddha statue be placed near the well, so the water would run over it, and also blessed the water in the well. This well water is mixed with holy water from Mount Kailash, so it has the continual blessing of the water from Mount Kailash. It purifies all beings, people, and animals—anyone who drinks water from this well. It is very blessed water. This is the holy water of the enlightened deity Vajrayogini. The benefit of drinking this water is that when you die you will be reborn in the deity’s pure land, where you will be liberated from all suffering and will achieve enlightenment. Before you take water from the well, you should offer it as a bath to the Medicine Buddha. In this way, you purify negative karma and defilements, and create vast amounts of merit and causes of happiness and success. After you have offered it to the Medicine Buddha, think the water came from Buddha and put it back in the well. Then take water for yourself, your family, and others. As the water comes from the Buddha’s holy body, drinking and washing with this water purifies the mind of the negative karma of body, speech, and mind, which is the cause of all problems, now and in the future. It also becomes powerful healing for sickness. The most important thing is, the more faith you have in the power of the water, then the more powerful it is for healing and purification, and for survival. It is good that anyone who drinks this water practices the good heart, to not harm others, whether human beings or animals, and to be kind to others every day. Please enjoy. Also, the water over which I chanted mantras, many thousands of OM MANI PADME HUMs, was put in the well, so that means there is a continuum of blessing, so I guess it can be used. By blessing the water with mantras for healing and blessing the water source, even if there is no water from Mount Kailash, it can purify negative karma and be healing. It would be good to have a Maitreya Buddha statue at the well for the villagers. We could put a sign: “Sponsored by Maitreya Project.” Later we can also put a Mitukpa statue there to make the nagas happy. If they get disturbed the water will dry up. The main cause for the water being there is that the people have the good karma to have the conditions to be able to drink. Also, there is a puja for the nagas when the water runs dry. People can receive blessings by washing and drinking the water from the well. According to my observations, the best statue for the well itself was Medicine Buddha. This is also easier for people to relate to. I recited Buddha’s auspicious prayer for healing, for all to recover from sicknesses and for all who come to drink never to be reborn in the lower realms, to find faith in the Triple Gem, and achieve enlightenment. What’s important is to have a happy mind and not give harm in this world to any living being. This is an auspicious prayer to eliminate any negativity and for healing. I made a request to Medicine Buddha and we all made prayers that anyone who drinks the water is immediately purified of all negative karma, is never reborn in the lower realms, is free from all sicknesses and spirit harm, finds faith in Buddha, Dharma, and Sangha, develops loving kindness, compassion and bodhicitta, stops giving harm to all living beings and only practices kindness, bringing peace and happiness, and for everyone in this world to become like Chenrezig. Rinpoche made the following comments on rejoicing when a taxi comes. We were waiting for a taxi, and it took some time to get one. The thought came while we were waiting that it’s good to practice rejoicing when the taxi comes and other people get inside. It’s good to practice rejoicing that the person received happiness, what they need. This is an excellent practice, and helps the negative emotional mind, anger, and being upset not to arise. You keep the mind in virtue and Dharma because you are sincerely wishing happiness for others. This is very pure Dharma and also keeps your mind in a state of happiness. Wishing happiness for others opens the door of all happiness, whether wishing happiness for an insect, a person, or many people. In the Lama Chöpa it says, "The mind that cherishes all mother beings and would secure them in bliss is the gateway leading to infinite virtue." This is from the Buddha's Mahayana teachings. This means it becomes a cause for enlightenment. If you want to be, like His Holiness says, intelligently selfish, rejoice. The common result of rejoicing in this way just once, in this life and hundreds of thousands of future lives, is you have no difficulty finding a taxi, you immediately find a vehicle when you are traveling. It could be difficult for other people, but for you it is easy. It creates the karma for that. Your rejoicing does something good, such as this practice of thinking of the karmic result, which is happiness for yourself. This is called being intelligently selfish, because at least from this you get the karmic result of happiness in a future life, at least it becomes Dharma and virtue. Rinpoche made the following comments about how to deal with problems when you’re driving. When you are driving along in your car and suddenly another car goes in front of you, you get upset. Then, the next car does something they are not supposed to do in front of you or next to your car. Remember that this unfavorable condition is my negative karma created by my selfish mind, my ego. This is the wheel of sharp weapons, the negative karma I created when I harmed others, circling back on me now. Without delaying for even a second, while the wheel of sharp weapons of my negative karma is turning on me, I immediately use it to cut my enemy, my ego. Rejoice how this is the happiest, most wonderful thing in life—using the wheel of sharp weapons of my negative karma, produced by my ego, to cut my enemy, my ego. This is the happiest life, the most wonderful opportunity in life—to cut my ego using the sharp weapon of my negative karma. I cut the ego with the wheel of sharp weapons produced by my negative karma circling back on me. Here, first, you are accepting the problem, as it is caused by your karma. By doing that, it pacifies the negative emotional thoughts, feeling upset or angry. The second thing is that you're looking at the shortcomings of ego, the harm given to you by ego. Third, you are using the harm given to ego to turn back on and cut the ego, that means destroying the ego, the self-cherishing thought, so that then bodhicitta can rise. From that you can achieve enlightenment. Then, you can liberate numberless sentient beings from the oceans of samsaric sufferings and enlighten them. When that happens, that’s the ultimate goal of your life, the very meaning of your life is completed. This is one example, and you must think similarly in daily life with anything that annoys you, which disturbs you suddenly. Think like this about something with which it's difficult to practice patience, like when anger suddenly arises. Rinpoche gave the following advice to a man who makes hats with mantras displayed on them. Thank you very much for taking a precious human rebirth and making your life most beneficial for sentient beings in the ten directions in this world. It is a great gift for me that I have you. You are always such a happy person, that is another of your qualities, always filled with inspiration, devotion, intelligence, compassion, all the important stuff. These are the roots within you. So, I am very proud of having you. Maybe after a few years I will sell you to His Holiness the Dalai Lama or put you inside a mandala and offer you. I would like to thank you very much for everything, for all your dedication, benefiting others, your traditional practice, and all the beautiful Dharma hats with mantras on, which liberate so many sentient beings every day in this world. It is such an easy way to liberate sentient beings from the ocean of samsaric suffering, bring them to enlightenment, and attract them to the Dharma Center, as well as to the retreat center. HA HA HE HE HO HO [Rinpoche laughing]. Just by wearing this hat in public, playing golf, in the street, on the beach, where many people are shopping, in the market, anywhere that animals or people can see you, you are liberating others. If an insect flies around your hat (with mantras), or an insect goes under or around the hat, or a person walks around you on the way to a shop, you are liberating them all the time. You are bringing so many sentient beings, who are suffering, to enlightenment. The hat enlightens even the flies. OM MANI PADME HUM is the mantra of the compassionate Buddha, who is the embodiment of all the Buddhas. This mantra is for developing compassion, which is the most precious, wish-fulfilling thing, for all happiness, including liberation from the oceans of samsaric suffering, up to full enlightenment—the peerless happiness. You, one person, by generating compassion, can liberate all suffering sentient beings, who equal the limitless sky, from the oceans of samsaric suffering, and bring them to full enlightenment, fulfilling all their wishes and happiness. The mantra on the front is from Buddha’s sutra teaching called Chulong Rolpai Do. Merely seeing this mantra pacifies 100,000 eons of negative karma. Any sentient being who walks under the mantra on the back of the hat purifies 1000 eons of negative karma. 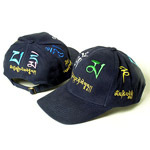 Seeing the mantra on the left side of the hat, below the signature, enables one to achieve enlightenment. Of course, this applies to OM MANI PADME HUM as well. There is no question that this mantra also has this benefit. Also, it purifies one’s very heavy negative karma, including purifying the five uninterrupted negative karmas.